Earlier this year, I discovered Jose Saramago for the first time and lamented the fact that it had taken me so long to find him. Well, now that I’ve read Blindness, I must confess that I’ve become a bit of a crazy fan girl. This book was even better than The Double, more riveting, more disturbing, more beautiful, more everything. In the opening chapter of the novel, a man is sitting in traffic at a stop light. When the light turns green, he doesn’t move. Horns blare, drivers get out of their cars, and the man cries out, I am blind. Who would have believed it. Seen merely at a glance, the man’s eyes seem healthy, the iris looks bright, luminous, the sclera white, as compact as porcelain. The eyes wide open, the wrinkled skin of the face, his eyebrows suddenly screwed up, all this, as anyone can see, signifies that he is distraught with anguish. With a rapid movement, what was in sight has disappeared behind the man’s clenched fists, as if he were still trying to retain inside his mind the final image captured, a round red light at the traffic lights. This sudden attack of blindess, known as the white sickness, because its victims see only white, is the start of an epidemic. The government rounds up the blind and the contaminated (those who have been exposed to the blind) and places them in an abandoned mental asylum in an attempt to contain the spread of the affliction. Only one person seems immune, the wife of the ophthalmologist whom the first blind man goes to for treatment. She pretends to be blind so that she can accompany her husband to the quarantine. It is through her eyes that we see the horrors the blind experience. And it is through her compassion and her courage that a small group of the afflicted manage to survive with their humanity intact. The horrors depicted here are some of the worst I can recall reading about in fiction. The dehumanizing conditions in the asylum where the blind are left brings out the worst in many of them. The chapter immediately after one faction of the blind take control of the limited rations and demand that the others send them their women was almost too much for me (and I read Stephen King). But the horror makes the moments of grace stand out all the more. Glasses of water drunk from crystal glasses, a mysterious hand that washes an old man’s back, a dog that dries a woman’s tears—all of these things take on a beauty that brought tears to my eyes. Saramago has managed the trick of depicting the truly horrible and the truly beautiful without weakening the impact of either. I’m eager to see what else he can do. Because Saramago is a Nobel prize winner, this book qualifies for the Book Awards II challenge, so I’m at 6 down, 4 to go. I stopped reading your review after the first paragraph. But only because I hate knowing any details of a story before I read it. I like my novels to be like life, a surprise at every turn. I’ve had a copy in my library for some time now and you’ve reminded me to get to it asap. I’ll come back and read your review after I’ve read it. Glad you liked it, I hope I do too. I’m doing the Nobel reading challenge as well. I was delighted to read your review of Blindness – serendipity rules – Our book group picked it last week, and I’ve just read the first dozen pages … looks like I’m in for a great read. His paragraphless, speechmark less style may take a while to get used to though. Glad to hear you’ve enjoyed Saramago, as I hope to do the same. All of his premises are intriguing. Ha! I was at the library on Saturday looking for this very book. It wasn’t in, so I got a stack of others — but I hope to pick this one up soon. Thanks for the lovely review! It sounds wonderful. I wonder if you are aware of the fact that many blind Americans are outraged about Saramago’s book and the movie based on it. Saramago portrays blindness in an erronious, bigotted and hurtful way. Blindness does not consign a person to a life of terror, helplessness and depravity. If Saramago had used another minority image — say making the virus cause white people to become black or straights to become gay — theaters would burn and the Nobel committee would have never considered his works for their highest honor. There are blind lawyers, computer programmers, chemists, teachers, entrepreneurs, parents and so on. We do our own shopping, cooking, cleaning, laundry and have a wealth of leisure activities from mountain climbing to knitting. Despite this, however, and a revolution in technology which has permitted blind people to participate in all aspects of life more than ever before, unemployment among working-age, blind Americans has remained stagnant at seventy percent for decades. Perhaps even more scandallous is the fact that only ten percent of blind kids are taught to read Braille: the only reading method offering tru literacy and the common link among most successful blind people. We are bullied and discriminated against at every turn, and our issues rarely get the slightest mention in the mainstream media. Why? Many of us believe that it is due to misunderstanding and fear by the sighted public. Saramago’s work contributes to this. Many well-educated, talented and motivated blind people live in poverty because society would rather spend millions supporting us with disability checks than to recognize our skills, talents and contributions and work shoulder to shoulder with us on a daily basis. 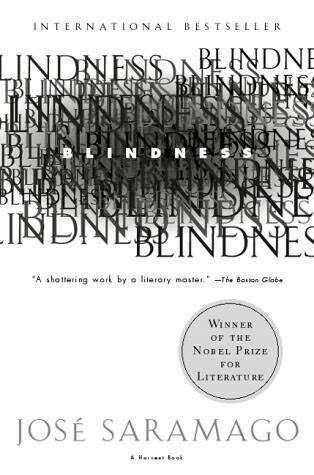 That Saramago chose blindness as a metaphor for his attempt at social commentary is evidence of his mediocre imagination. That others embrace it without the slightest mention of the damage it does to an oppressed minority shows just how deep the prejudice is. The Performing Arts Division of the National Federation of the Blind (www.padnfb.org) is working to improve understanding and acceptance of American’s 11 million blind and low vision citizens. Why don’t you write about that? Sandra: Do come back and tell me what you thought. I’ll be watching your blog for a review. Gaskella: Yes, the style does take some getting used to. Normally, I don’t care for such unconventional paragraphing and punctuation, but Saramago makes it work. It didn’t enhance the experience for me, but once I got into the story, it didn’t bother me either. adevotedreader: Yes, his premises are intriguing. It was the premise of The Double that caught my interest—I didn’t evne know he was a Nobel laureate when I picked it up! Jenny: First, the Calvino and now this! Just wait, one of these days we’ll end up reading the same thing at the same time and get a review set to post on the same day. Donna: I was aware of the protests about the movie, but I think it would be a mistake for readers to extrapolate from the specific situation depicted in this book that blind people are helpless. I’m sure you would acknowledge that upon first becoming blind many people do feel helpless and need some support as they learn to live independently. These characters are suddenly struck blind and almost immediately shunted to an asylum with inadequate water, food, and plumbing and no help from outside. Interestingly, by the end of the book, the people do find ways to adjust and whether they get their sight back starts to feel irrelevant. If people take away from this book the message that blind people are helpless, I believe they are misreading it, which is hardly Saramago’s fault. What an amazing review! I listened to Blindness on my MP3 and loved it, I then read the actual book before going to see the movie. I have to say that normally I don’t enjoy movies based on books, but Blindness really blew me away. It perfectly portrayed the emotions that I felt were most important to the story. I think that the people being struck blind in this novel are portrayed in a very accurate way – as the situation is much different from in real life. The first few are blind for no reason, which would make a person especially vulnerable and within weeks the blind are being targeted much like carriers of the plague. They are treated like animals, shunned from society and are in constant danger of being killed. Much different from real life, where the sight-impaired are helped to adjust and accepted freely in society. I have seen many blind people working in our city, in many different jobs. There were blind children in public school with me, in the normal classes from elementary to high school. I’m from Canada, not the USA so maybe it is a difference in our health care systems. Joanne: I’m glad to hear the movie is worthwhile. The reviews have been terribly mixed, and I’ve been hesitant to see it, even though I admired Meirelles’ other movies and like Mark Ruffalo an awful lot. Into my Netflix queue it goes. I had never thought about listening to Saramago on audio, but I bet his style would work pretty well because in both books I’ve read his narrator sounds like a person, what with the various digressions and editorial comments. Pingback: Review - Blindness by Jose Saramago (and a poll!) « Hey Lady! Whatcha Readin’?